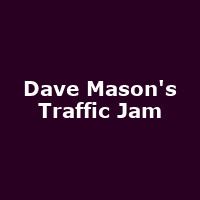 "Renowned for such Traffic hits "Feelin' Alright" and "Hole In My Shoe" plus his solo signature tracks "We Just Disagree" and "Only You Know and I Know,", Dave Masons's Dave Mason's Traffic Jam will feature the music of Traffic." Traffic were an English rock band formed in Birmingham in 1967 by Steve Winwood, Jim Capaldi, Chris Wood and Dave Mason. The band released eight albums from 1967 to 1994.